Eunos 500. 1992–9 (prod. unknown). 4-door sedan. F/F, 1839 cm³ (4 cyl. DOHC), 1844, 1995 cm³ (V6 DOHC). Small, refined luxury sedan from Mazda, built to a higher quality than the Capella, on the same platform. 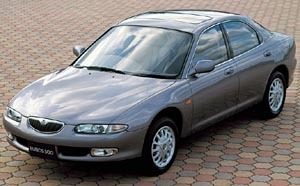 Sold as part of Eunos range in Japan, but called Mazda Xedos 6 in most export markets. Notable for the very small V6 engines available, and for looking like a modern interpretation of a Jaguar, a brand which Mazda’s design chief, Takeshi Arakawa, liked. Sold to 1995 in Japan, but continued to 1999 for export.